The 2019 NFL Free Agency period kicked off in a big way during the league’s annual legal tampering period, however, now that deals are official, we can sift through the myriad of contracts to see who really executed their gameplan well and who may have faltered so far. 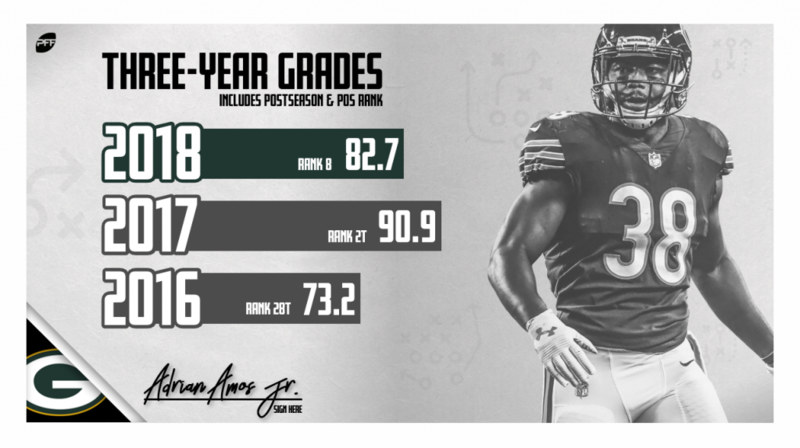 Using PFF grades and assessing at the amount of money shelled out to players individually, we take a look at the five most underrated and five most overrated deals so far. Why it’s underrated: Injuries are the obvious reason why Hicks’ deal paled in comparison to Kwon Alexander’s, Anthony Barr’s, and C.J. Mosley’s contracts, but when he’s been on the field, he’s been the best of the bunch. Even after his Achilles tear, Hicks was the highest-graded of the group this past season on 775 snaps. He has all of 25 missed tackles for his entire career — a figure Alexander has topped in single seasons — and he has proven well in coverage, something vitally important in today’s NFL for a linebacker. Why it’s underrated: You really have to dig deep for the reason why we love Nsekhe, seeing as he’s never played more than 403 snaps in a single season. When you take his performance over the last three seasons in Washington, where he’s amassed 1,093 snaps — approximately a full season’s worth — you get one of the better tackles in the NFL. 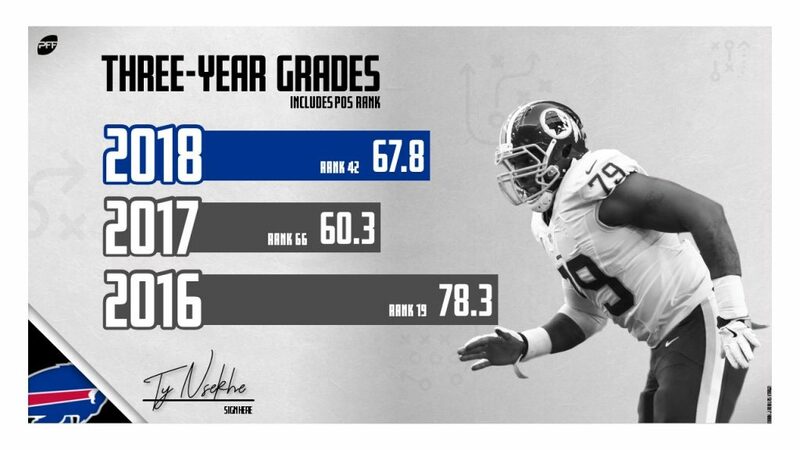 Over that span, Nsekhe has an overall PFF grade of 71.6 and has shown well in both pass protection and with his run blocking. Why it’s underrated: The fact that unquestionably the best safety on the market ended up going for the third-most money on a per-season basis is by definition a steal. You can see why teams would want to go younger, but the soon to be 30-year-old should still be one of the best safeties in the league over the lifespan of his four-year deal. In five out of the last six seasons, Thomas has earned a coverage grade of at least 89.0. The truly Hall of Fame talents tend to age gracefully, and Thomas belongs in that category. Why it’s underrated: With how valuable the ability to win down the field is in the NFL, it’s surprising that Brown was given a modest three-year, $27-million deal. The last time he played with a quarterback that earned a grade of 75.0 or higher on the season was 2015, and in that year, Brown went for over 1,000 yards. Even last season, Brown was on pace for 1,068 yards before Lamar Jackson took over and zapped his effectiveness. Still, He finished the 2018 season averaging 1.50 yards per route run, which topped Tyrell Williams (1.41) and Adam Humphries (1.43), both of whom received bigger deals. Why it’s overrated: This isn’t just a case of saying it’s an overpay because Brown got the biggest contract of any tackle in NFL history. It’s saying that there’s not much to suggest Brown will ever be a top-10 tackle in the league. 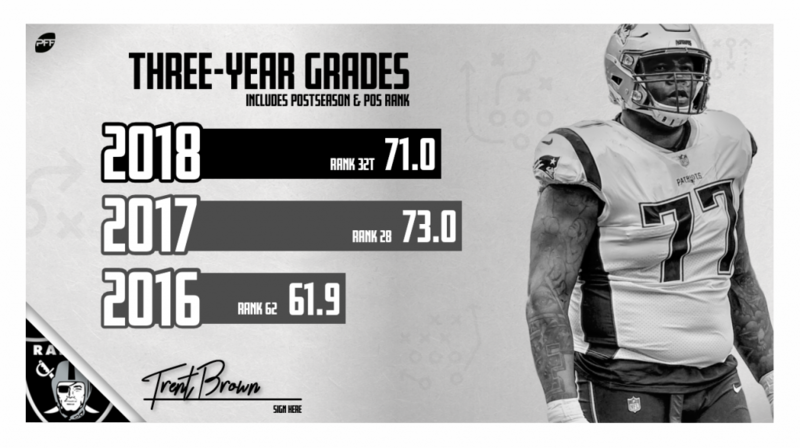 This past season, Brown allowed 35 pressures even with Tom Brady’s quick release. Even compared to the 26 other NFL tackles who took over 1,000 snaps, that figure ranks 18th. That’s certainly an upgrade for Oakland where Kolton Miller’s 65 pressures allowed were second worst, but it came at a premium. Why it’s overrated: The right tackle position could be worse in Cincinnati, but not by much. Paying $7 million a year not to be the worst seems a little outrageous. Hart allowed an egregious 10 sacks and committed 11 penalties last season. He is only 24 and the developmental curve along the offensive line can take a while, but the signs aren’t encouraging. Why it’s overrated: Alexander has been — by a good margin — the worst tackling linebacker in the league since he was drafted in 2015. Even after playing only 366 snaps last year before an ACL, Alexander’s 78 misses are the second-most in the league over the previous four seasons, while his 18% missed tackle rate is the worst. The 49ers already had a very serious tackling problem with the third-highest missed tackle rate of any defense in the NFL last season (15% of attempts). Alexander can undoubtedly cover a ton of ground, but they expect a lot of misses in the future. Why it’s overrated: Humphries is a case of volume stats versus rate stats. 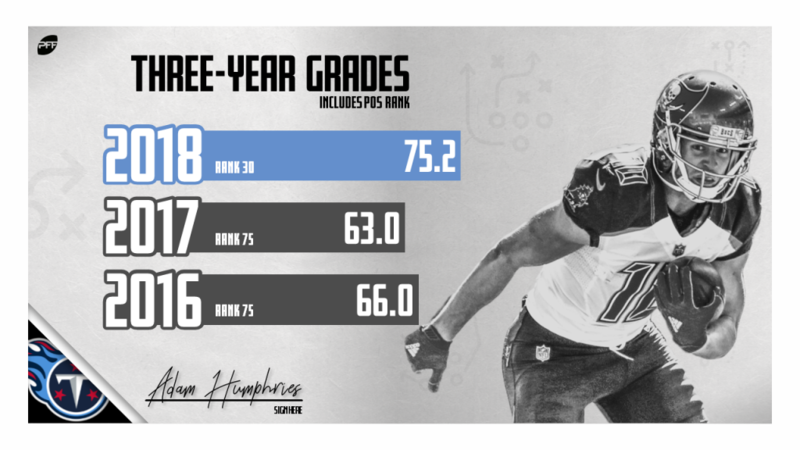 Humphries’ 816 yards look great and were the 28th-most at the position in the NFL this past season, however, the former Bucs wideout benefited greatly from the fact that the Bucs’ 729 passing dropbacks were the second-most in the NFL. On a per-pass basis, Humphries’ 1.43 yards per route run only ranked 52nd among 96 qualifying receivers while his 1.41 yards per route run from the slot were still only 12th out of 26 qualifying players at the position. Why it’s overrated: We at Pro Football Focus get that offensive weapons were sparse on the free agent market, but that doesn’t mean a team should have had to pick through the bottom of the barrel on the first day. Kroft got $7 million a year after all of 616 yards in four seasons with the Bengals. Even in the lone full season where he was a full-time starter for the Bengals in 2017, Kroft ranked 20th out of 22 qualifying tight ends with a measly 1.06 yards per route run. That’s not doing Josh Allen any favors, and as of right now, he needs all the favors he can get from the Buffalo front office.